Dan Kingma drains his second three-pointer. Washington trails 25-24. I dunno, but I'm ready for a nap. RT @DougHaller: Is Nigel Williams-Goss ready for the NBA? Media timeout. Washington leads 26-25 with 3:48 left. 26-25 Washington with 3:48 left before halftime. Two ties and nine lead changes. Both teams with 11 buckets but Huskies 4-6 from long range. King a is the guy Romar never has. A non athletic player that does nothing but drain shots and make plays. Nastic 11 points (5-6 FG) and four rebounds. @TwoShotOne six points on a couple three-pointers. Randle 0-3 FG but limited with two fouls. Kingma is staying mostly in front of his guy. he's playing a pesky d.
I've had 3 drinks and a bong hit and I saw that one. Mike Anderson with five assists and four rebounds already.
.@TwoShotOne connects on two free throws. Went three games without an attempt from the line. But against Washington this season: now 23-30. I'd sign the petition to get Walton off the network. In the two regular season meetings, Washington converted 8-33 from three-point range. Tonight, the Huskies are 6-8 from distance. Dan Kingma has been so good, Romar can't take him off the floor. Wow. Wow. Wow. Refs are either late to their whistle or they skip em altogether. PAC12 should be ashamed. 11 lead changes as Washington leads 32-30. 58.7 ticks left before half. Three-point shooting the difference: Stanford 2-11, Washington 6-8. On a side note, it was fun watching the Clippers (with 3 Seattle hometown players) whipped the Blunder. G-W trying to play himself out of the first round in the draft tonite. 32-32 at half. Five ties, 11 lead changes in the first half. Both teams shooting 46%. Washington 6-9 from deep. Stanford 6-8 from the line. Two free throws from Randle concluded the half. They represent his only points of the game, having missed his three attempts from the field. Nastic game-high 11 points (5-6 FG) with four rebounds. @TwoShotOne eight points and four boards. Stanford holds a 21-10 rebounding edge. Stanford has been tied at halftime twice this season, winning both games. Cardinal has led at intermission only once in last 11 contests. Tie game at the half of our nightcap! Stay up and watch on @Pac12Networks! Stanford shot 12-26 overall in first half. First time the Cardinal shot better than 39.3% in first 20 minutes since Jan. 31 at WSU (45.2%). Random halftime question: Why do men spit in the urinal at arenas before using it? No one does that at home. Serious question. Second half ready to get started. Same starters for Washington. I never look around to see what others are doing. 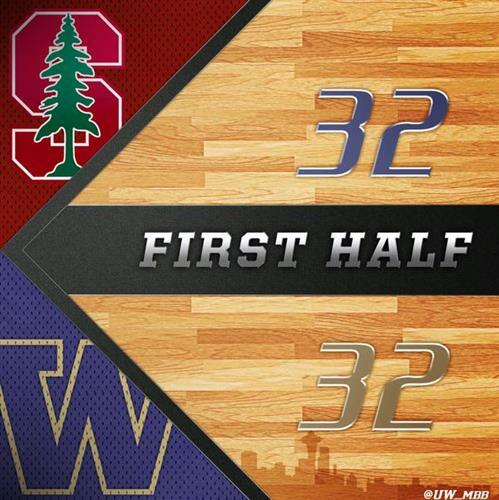 Stanford timeout after Mike Anderson drained a three-pointer that put Washington up 39-35 with 17:10 left. Washington ahead 39-35 with 17:10 remaining. Randle knocks down his first bucket (a triple) but the Huskies counter with their seventh trey. 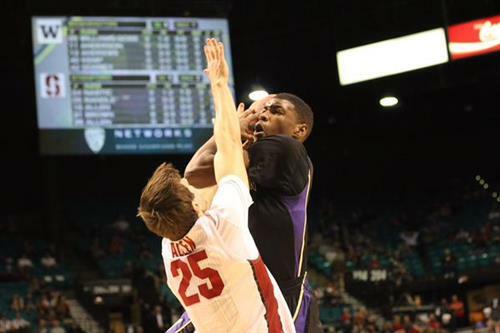 Stanford averages only 10.8 turnovers per game, which leads the Pac-12 and ranks 33rd nationally. Cardinal with seven miscues tonight.